The Tunica Roadhouse Casino & Hotel is a casino, hotel and spa located in Robinsonville, Mississippi. 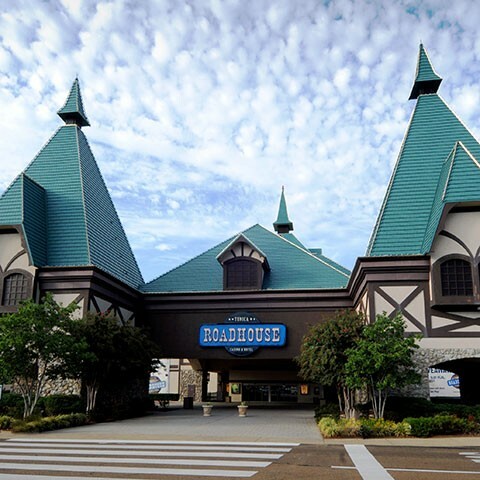 It is themed to resemble a roadhouse, and is marketed as a place to “get wild”, housing many features unique to Tunica casinos, such as a mechanical bull, as well as beer pong and other “bar games”. It’s one of three casinos located in Tunica. Roadhouse offers 135 suite style rooms. Play your favorite Tunica table games at Tunica Roadhouse and you’ll get your thrills – whether you prefer blackjack, craps, roulette or something more exotic. They have 36 table games, where you’ll find some of the lowest limits in town. Want to go wild on the slots, Tunica Roadhouse is the place to play! All your favorite casino gambling in a variety of denominations, from pennies to high limit machines. If penny slot machine games are your Tunica casino thing, Tunica is your spot. Casino offers more than 200 of your favorite games, including Monopoly Super Money Grab, Indian Princess, Magic Mermaid, Pompeii, Amazing Sevens and Triple Butterfly Sevens.